The world is changing fast and so is the world of work. Technological transformation, global competition forces, and demographic change will continue to affect how people work, consume and live. These mega-trends have made the labour market more dynamic and have brought with them more diverse forms of work and new jobs, requiring new skills. They also have the potential to contribute to increasing inequality and challenge time-honoured institutions. Thus, established labour market regulatory frameworks and solidarity mechanisms may need to be adapted so as to ensure the sustainability of the welfare state and guarantee adequate protection for workers. These changes, however, should be viewed as an opportunity for the European working age population, whether they are employees or self-employed, senior professionals extending their working lives or aspiring graduates and young entrepreneurs just entering the labour market. Policies are needed to help workers and entrepreneurs prepare for and adapt to technological changes, so that all EU residents can seize the opportunities they bring, while benefitting from adequate protection in case of need. Against this background, the European Parliament, the Council and the Commission proclaimed the European Pillar of Social Rights at the Gothenburg Social Summit of 17 November 2017, where the Commission also set out its vision for a European Education Area by 2025. 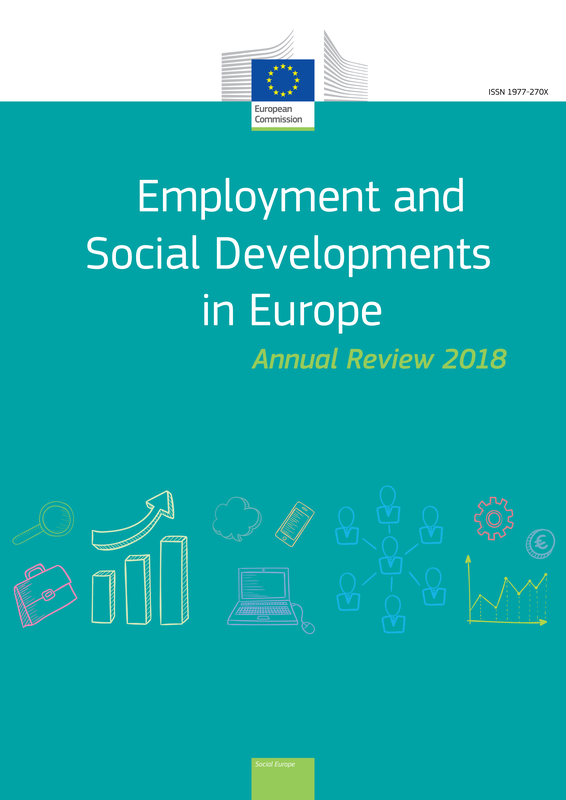 European institutions thereby showed their commitment to fostering equal opportunities, to improving access to the labour market and Union-wide learning opportunities, to fair working conditions and social inclusion, to supporting people in the face of changing realities of work and to achieving new and more effective rights for Europeans. The European Union has been proactive in responding to the changing world of work, for instance through the targeted deployment of EU funds, various legislative proposals such as on work-life balance and access to social protection, and the Skills Agenda for Europe, which sets out ten actions intended to make suitable training, skills and support available to the EU population. Last year's Employment and Social Developments (ESDE) Review looked at how, among other things, demographic change affects intergenerational fairness and solidarity in the EU. This edition of the annual ESDE review of continues the exploration of the impact of the mega-trends mentioned above by contributing to a better understanding of the changing world of work and its implications for employment and society. It will do so by analysing key employment and social issues for the European Union and its Member States, building on the key principles of the Pillar. The findings of the analysis are in line with the priorities outlined in the European Commission's proposal of May 2018 for the EU's post-2020 Multi-Annual Financial Framework. The report reviews trends towards increasing automation in production and new forms of work appearing in labour markets. Specifically, it considers what these trends imply for equal opportunities, fair working conditions, adequate and sustainable social protection, and the dialogue between the social partners. The crucial questions on which this ESDE annual review focuses are: how is the world of work in the EU changing? What are the benefits and risks emanating from these changes? Are robots and automation creating more jobs than they are destroying? What skills will the future labour market require and how can people be helped to acquire them? How are changes in the world of work affecting the social fabric, including inequality? How can decent working conditions and adequate social protection be ensured in the years to come? In other words, how can the resilience of Europe's labour force be buttressed so that it can support the competitiveness of the EU economy and the well-being of European society in increasingly globalised markets? In 2017 and early 2018, the EU economy outperformed forecasts by expanding at the highest pace recorded since the onset of the crisis in 2008. Real GDP growth accelerated to 2.5% (in both the EU and the euro area) from 1.9% in 2016. Private consumption remained the main driver of economic growth but 2017 also saw an improvement in investment, while net exports rebounded strongly from their 2016 level, contributing significantly to the overall economic expansion. Economic recovery picked up pace in 2017. Stronger output growth in 2017 than in previous years, in conjunction with solid employment expansion resulted in an increase in productivity growth in the EU and in the euro area. This and the modest growth in nominal compensation per employee resulted in a very limited upturn in nominal labour costs. Nonetheless, there were large differences between Member States. The effects of the improving macroeconomic environment were also observed in the evolution of unemployment. The unemployment rate declined slightly faster in 2017 than in the previous two years, falling to 7.6% and 9.1% of the labour force in the EU and in the euro area respectively (corresponding to 18.8 million and 14.7 million people). Long-term unemployment also continued to decline at the same pace as in the previous two years, but still represents an important challenge: it constitutes nearly half of total unemployment. Unemployment decreased in all Member States but there are substantial disparities between countries, with some experiencing a tightening of labour markets. The number of unemployed people aged 15-24 fell to 3.8 million in 2017, well below the levels before the crisis (4.2 million in 2008). Despite the marked improvement in the labour market situation of young people, youth unemployment and long-term and very long-term unemployment in the EU continue to be sizeable in a number of Member States. Employment growth also continued to benefit from the favourable macroeconomic environment. In 2017, roughly 235.8 million people aged 15+ were in employment in the EU (around 156 million in the euro area), over three and a half million people more compared with 2016. The upward trend persisted in early 2018, with the number of the employed people marking a new all-time record of 237.9 million in the first quarter of 2018. The employment rate increased in 2017 by around 1 percentage point (pp) to 72.2% of the population aged 20 to 64 years. Assuming this positive trend continues, the EU is well placed to reach its Europe 2020 target of a 75% employment rate. At the same time, the number of hours worked per person employed grew only modestly and is still below the 2008 levels. …while solid employment growth brings the EU within reach of its Europe 2020 target. Although 2017 saw a continuing shift of job creation away from the industrial, manufacturing and construction sectors towards service-oriented activities, this trend did attenuate somewhat as employment grew in all sectors except for financial activities. Part-time employment as a proportion of total employment remained stable in 2017. Employment grew in all sectors except financial activities. The social situation in the EU continued to benefit from the economic recovery. From 2014 to 2016 incomes from work increased and, together with social transfers, led to a rise in the disposable incomes of households in the EU and in a large majority of Member States. In 2016, there were 5.6 million fewer people at risk of poverty or social exclusion than at the peak of 2012 even though the proportion of people at persistent risk of poverty increased. Severe material deprivation declined in almost all Member States, falling to an all-time low of 33.4 million in 2017 (roughly 16.1 million fewer than the peak of 49.5 million in 2012). These positive developments are a considerable achievement, signifying that the EU has by now largely overcome the crisis. But, there are still reasons for concern. Income inequality in the EU in the last few years has stabilized at and has marked increases in roughly a third of the Member States. This is the case despite the significant redistributive effects of European tax and benefit systems. In particular, social protection expenditure continues to play an important role in supporting household incomes and it has been increasing in the EU. Moreover the number of people at risk of poverty or social exclusion, albeit reduced relative to 2012, remains at a level (118 million in 2016) which is still very far from the important Europe 2020 target of taking 20 million out of risk of poverty and social exclusion: it is roughly 800 000 people higher than when the target was set. However, notable differences across Member States persist and certain countries (e.g. Poland, Romania) have achieved their individual targets by a very large margin. But inequality and relative poverty persist. Between 2008 and 2017 the crisis and the relatively drawn-out recovery seem to have brought about greater dispersion in labour markets performance and social situations across the Member States. Severe material deprivation may be a notable exception, as there is a clear evidence of progress in limiting the number of people affected by it in the overwhelming majority of Member States. Unemployment rates across the Member States should become more similar from 2018 on, assuming the recent positive developments continue. For other indicators, such as the employment rate or Gross Disposable Household Income per capita, the crisis resulted in some divergence. Although this divergence was mostly offset during the subsequent recovery, there is not yet strong evidence of an all-encompassing converging trend. The crisis slowed down the pace of convergence in EU labour markets and social situations. Recent transformations are pushing the world's economies towards fast restructuring. Global competition increases pressure to optimise production processes and new information and communication technologies (ICTs) are developing quickly. Organisations and markets are globally intertwined through the internet while robots, other digital technologies and artificial intelligence are revolutionising the way products are being designed, produced and consumed. These new technologies create new markets and re-define the task content of jobs while making some traditional tasks obsolete. Concurrently, the sectoral shift from industry to services, which is a result of globalisation as well, has been going on for decades. Manufacturing as a proportion of total production and employment has been in continuous decline, while services have gained importance. Technological change is linked to two new trends: first, a faster improvement in the quality of capital to which labour needs to adjust, and, second, more flexibility in the organisation of the production process that brings about greater diversity in forms of work. Both have major implications for the EU's labour force and, eventually, for social conditions. …is coupled with greater diversity in the forms of work. The ongoing technological shift, together with globalisation, has contributed to an increase in the capital intensity of production, particularly in manufacturing and transport and logistics. For instance, capital intensity in Italy's trade and manufacturing sectors has increased by more than 50% since 1995. So far, technological change has for the most part fuelled growth and driven improvements in human capital stock. However, the increasing use of industrial robots and machines in certain sectors, especially in the automotive sector (which accounts for half of the total number of robots) and in the metal products industries, increases the likelihood of their replacing people in a number of (usually low-skill) routine tasks. The stock of industrial robots in Europe has more than quadrupled in the past 25 years (from around 95 000 to over 430 000), with more than 40% currently located in Germany. While there is a divergence of views in the academic literature on the potential impact of technology on job creation vs. destruction, according to some studies, if existing new technologies were adopted in production processes, they could automate between 37% and 69% of today's tasks (depending on the Member State), leading to a significant change in the set of tasks performed on the job in many sectors. The number of robots in the EU industry has quadrupled in the last 25 years. Such estimates point to a high likelihood of extensive substitution of capital for labour in certain tasks and a high complementarity of capital and labour in other tasks. According to simulations undertaken in Chapter 2 on the economies of selected Member States (Italy, Germany and the Czech Republic), this transformation could bring about job losses but also new job creation. The losses will first affect the manufacturing sector. Indeed, a closer look at the processes of capital deepening (the increase of capital intensity in production) suggests that the capital stock is likely to increase, also because of the expected substitution of capital for workers with low-level skills and low-level education. But substitution is not the only motivation for capital investment. In fact, a better-educated, better-skilled labour force is complementary to capital, and an increase in physical capital can be stimulated by an upgrade of human capital, as demonstrated by the case of Germany. In other words, capital deepening occurs not only to replace labour but also to enable better-qualified workers to get full value from innovative technologies. This finding suggests that automation and artificial intelligence in general have significant potential for job creation. The European Commission recognised this potential early and is taking action to foster the take-up of artificial intelligence by the private and public sectors. In its Communication of April 2018 on Artificial Intelligence for Europe, the Commission outlines a number of measures and financing instruments through which it will promote this goal. Some Member States, too, are active in this area; for instance, France has announced a EUR 1.5 billion investment in artificial intelligence over the next five years. The other trend, whose emergence has been greatly facilitated by the spread of innovative technology, is the increase in the number of non-standard (atypical) workers, i.e. workers in contractual relationships other than full-time open-ended contracts with a single employer, and a concomitant decrease in the number of full-time permanent employees. Furthermore, job polarisation has been observed in all Member states since 2002, though to different degrees. Low-paying and high-paying jobs have increased steadily, while middle-paying occupations are on a declining path. Job polarisation is consistent with the hypothesis that the process of technological change in recent years has led to lower demand for labour in jobs in which routine tasks predominate, while strongly increasing the demand for labour in jobs in which non-routine tasks predominate. This has especially increased the demand for highly skilled workers. …and an increase in non-standard work, enabled by new technology and globalisation. For the moment, some changes in the labour market seem confined to small parts of the workforce. For instance, according to estimates by the Commission study "Platform Workers in Europe: Evidence from the COLEEM Survey", which was published at the end of June 2018, the proportion of adults who have provided work services through an online platform at some time is roughly 10% in the EU (ranging from 6% in Finland to 12% in Spain and the UK), while the proportion of people earning more than half of their income from platform work remains marginal, hovering slightly above 2% in 2017. Fewer than 8% do this kind of work with some frequency and fewer than 6% spend a significant amount of time on it (at least 10 hours per week) or earn a significant amount of income from it (at least 25% of the total). Even though these numbers are still relatively low, they may have a significant impact. Chapter 2 finds a correlation between the growing incidence of non-standard contractual relationships and higher income volatility and lower job security, as observed in the case of platform workers. Atypical forms of work are often associated with higher income volatility and lower job security. Globalisation and technological change require a re-orientation of educational policies and more efficient public spending, to ensure that the working age population is equipped with the right set of skills to reap the full benefits of structural change. Model simulations suggest that labour market transitions are likely to remain frequent as new technologies are incorporated in the production process. Greater and more effective investment in both formal education and the development of skills (through training) will improve workers' productivity and labour market outcomes while also ensuring the sustainability of Europe’s growth model. Job substitution by physical capital calls for better-qualified human capital. Ensuring that education and training provide people with the knowledge and skills they need to thrive personally, socially and professionally is a priority of the European Union as reflected in the vision for a European Education Area and the New Skills Agenda for Europe. Each of the 10 actions of the Skills Agenda is now underway. Actions such as the Up-skilling Pathways, the Digital Skills and Jobs Coalition and the Blueprint for Sectoral Co-operation on Skills, target up-skilling, cross-sectoral co-operation and identification of future skills needs as well as improving skills intelligence. Moreover, the adoption of the Council Recommendation on Key Competences for Lifelong Learning in May 2018 will further foster literacy, languages and entrepreneurship, among others, as a way to face the challenges of the future. The Commission also supports skills development in Europe through EU funds (e.g. the European Structural and Investment Funds, Horizon 2020 and the forthcoming Horizon Europe, the Employment and Social Innovation programme and the "Erasmus+" programme). The Commission is contributing to up-skilling and re-skilling, including through the Skills Agenda for Europe. There are various obstacles on the path to achieving a better-skilled and better-educated labour force in the EU. On the one hand, in recent decades there was considerable progress in education, as people attained higher educational levels than the generations before them. For example, the EU succeeded in reaching higher levels of tertiary educational attainment for adults aged 30-34 (39.9% in 2017) and in reducing the numbers of early leavers from education and training (to 11% in 2017), thus virtually meeting these two Europe 2020 targets by 2017. However, the results of the latest (2015) PISA tests in the key disciplines of mathematics, reading and science have once again sent alarm signals about the level of competence of 15-year-old Europeans. In all three disciplines, one in five pupils is a low achiever and the trend has strengthened recently. Moreover, there is strong evidence that low achievers at the age of 15 will remain low achievers as adults, because the lack of basic skills strongly reduces the likelihood of a person achieving a satisfactory labour market outcome. In effect, there is an employability threshold which a high number of people in the EU cannot yet cross because of their poor initial educational achievement and its link to the ability to benefit from lifelong learning. This situation represents a concern for the economy, too, because there is a shortage of each of these basic skills in almost all Member States. The poor PISA scores can be explained to a significant extent by a person's social background, measured by their parents' education attainment level. Having parents with only low-level education clearly reduces young students' chances of achieving high scores in PISA and attaining high skill levels during adulthood. The same is true for climbing the education ladder. All else being equal, people with highly-educated parents are ten times more likely to be highly-educated themselves than people from families with low levels of education. Indeed, in a subset of countries, the relatively tight connection between parental background and a person's achievement means that the educational system is unable to ensure equality of opportunity. Educational attainment and skill levels play an important role in determining labour market outcomes. Children benefit from educational achievements of their parents. Conversely, poor human and/or social capital, passed on by parents with low-level education, impedes individuals from achieving and maintaining high labour market performance. For instance, for people whose parents have only low-level education, the chances of being in employment - as opposed to unemployed or inactive - is 47% lower than that of people with highly-educated parents, while their chance of losing the job they are working in is 60% higher. … and so are people's labour market outcomes. Even when people from underprivileged backgrounds have managed, against the odds, to gain higher educational qualifications than their parents they may continue to experience residual disadvantages in the labour market. An unfavourable social background may still hamper someone's educational achievements. Furthermore, regardless of someone’s education, a lower level of parental education may reduce their chances of improving the quality of their jobs over the course of a career. Even higher education may not fully overcome disadvantage due to underprivileged background. However, social advantages are passed on to subsequent generations just as well as social disadvantages. . This finding has important implications insofar as it suggests broad margins for policy action. Compensating for the impact of social disadvantage on someone’s educational attainment and labour market performance may help many more people pass the employability threshold. This may be true not only for individuals but also for their children and following generations. In fact, there may well be an intertemporal multiplier of social achievements. One way to improve low-skill levels which are largely due to social background is to upgrade skills through lifelong learning. In that context, the analysis shows that intervention at a young age generates high returns both for the individual and the economy. The earlier lifelong learning begins, the better are the social and economic outcomes. But so far the take-up of training among people with low-level education and those in low-skilled jobs has been disappointing. Indeed, it seems that those who most need training make least use of it. Along with lifelong learning, promoting early childhood education for all can be effective in establishing a level playing field that reduces inequalities at an early stage in the life and work cycle. The need for action in this respect was recognised early by both the Commission and the Council, resulting in the Council Recommendation on High Quality Early Childhood Education and Care adopted on May 22 2018. The positive effects of better education outlast a single generation. Social disadvantage affects men and women alike. On average, women tend to be better educated than men. Additionally, recent progress in educational levels is mainly due to women improving their education level. However, analysis of women's labour market outcomes shows that good education is a necessary but not sufficient condition for good labour market performance. The female advantage in education fails to translate into more favourable labour market performance for women. In fact, the narrowing of the employment gap between men and women has recently come to a halt. A significant proportion of the female employment gap remains unexplained by the traditional factors (such as women's interrupted careers due to caring responsibilities, their concentration in lower-paid occupations, etc.). Non-observable factors in the individual data, such as national institutions and culture, are presumably keeping women's labour market participation rates low. The gap affects women's chances of finding and keeping a job or progressing to a job requiring higher skills and offering greater responsibility (job quality). Given that the changes in the labour markets are largely technology-driven, the digital gender gap may create further cause for concern: women are not sufficiently engaged in STEM (Science, Technology, Engineering and Mathematics). In 2015, women represented only 16% of ICT specialists. Women's advantage over men in education is not reflected in the labour market. As a result of the rapid changes taking place globally, adjustments in labour force education and skill levels have become decisive factors in reaping the benefits of modern production technologies. Reducing gender inequalities in the labour market and opening up new opportunities for hitherto underprivileged groups, especially in education, would allow the EU to upgrade the skills and expand the potential of the labour force, thereby generating more job creation than destruction. This would happen because technological change is likely to bring higher demand for well-skilled and well-educated people that would be easier to match if Europeans had access to better education and skills. The varying opportunities for education and labour market participation between different Member States suggest that the institutional environment can and does make a difference. This, in turn, implies that there is scope for disseminating good practices and exploring targeted reform. Limiting gender inequalities would also help to upgrade the skill levels of the EU workforce. Furthermore, as advantage or disadvantage in educational attainment is passed on from one generation to the next, the benefits of policy efforts and investments in education are effectively multiplied over generations. Implementing policies that counter multiple inequalities of opportunity, in line with the principles of the Social Pillar, will therefore yield lasting benefits for the European economy and society and improve their future resilience and sustainability. Combatting inequalities of opportunity can yield lasting rewards for the EU economy. Both the risks and the opportunities the changing world of work brings about may result in new patterns of inequality across different socio-economic dimensions. On the one hand, a greater diversity of forms of work can enhance workers' choices, facilitate reconciliation between work and private life and ease access to the labour market for disadvantaged or underrepresented groups, including women and older workers. The flexibility offered by new forms of work can also be an element of resilience in the face of economic shocks. On the other hand, non-standard work has some negative implications for workers' well-being compared with that of standard workers. This is because new forms of work often imply fragmented careers and more frequent periods of inactivity, which may lead to greater earnings inequality (as a result of differences in hours worked) as well as to diminished access to training opportunities, social protection and services. The flexibility in non-standard forms of work can enhance workers' choices. Income inequality in the EU-28 has remained fairly constant over the last five years after a moderate increase in the aftermath of the crisis. However, disposable income in the EU is more equally distributed than in other parts of the world, including in the US, although market (pre-tax) inequality in that country is lower than in the EU as a whole. In this context, changes in the organisation of labour are shaping the income distribution in various ways. Overall, the analysis of the impact of the different income components on inequality indicates that the contribution to inequality of the sources of labour market income (labour earnings and self-employment) has not significantly increased since 2008. Labour earnings in the EU have contributed to inequality only slightly more in recent years (88% in 2016 as opposed to 86.1% in 2008). Conversely, given the evolving character of self-employment, the contribution of income from self-employment to inequality has declined. Labour earnings remain the primary component of average income (around 66 %). Labour income distribution depends on a) the hourly wage and b) the hours worked. Insofar as changes in the world of work lead to a different distribution of working hours among workers, this will have an impact on inequality of earnings. Recent research shows that differences in hourly wages are the prevalent source of inequality in Eastern European countries, while in North-Western European countries a proportion of inequality stems from the distribution of working hours. In these countries, hours worked are both unequally distributed among workers and correlated with wages, so that those who earn higher hourly wages tend to work more hours and vice versa. This pattern can be increasingly observed in Mediterranean countries, too. …although non-standard working arrangements may increase income inequality. Inequality in the changing world of work may also emerge from an increased reliance on certain types of flexible work arrangements, such as solo self-employment and temporary work. This tends to lead to greater income volatility, which could, in turn, increase the vulnerability of workers in non-standard forms of employment. In a context of weaker income stability, the well-being of non-standard workers depends not only on income but also, crucially, on their capacity to draw on wealth and savings to smooth their consumption. It is therefore relevant to examine their living standards across different dimensions (including material deprivation and wealth situations) and employment types. Assessing the social situation of non-standard workers requires more than income measurements alone. Overall, standard workers have a lower risk of material deprivation and poverty than non-standard workers. While the poverty rate of the self-employed (24 %) is higher than that of standard workers (5 %), the former do not have a significantly higher risk of material deprivation than standard workers. However, the self-employed are a heterogeneous group, with the solo self-employed facing a much higher risk of material deprivation and poverty than the self-employed with employees. The wealth distribution across employment types further reflects this heterogeneity: the self-employed with employees hold nearly twice as much net wealth as the solo self-employed. In addition, the self-employed as a whole hold a higher proportion of wealth than those in other forms of employment. Despite evidence of a higher risk of income poverty for workers on non-standard contracts, the welfare gap in income poverty and material deprivation across employment types is largely explained by workers' socio-economic characteristics such as education and occupation. The future impact of changes in forms of employment on wealth distribution and the risk of material deprivation is therefore likely to depend on the (prior) socio-economic and skill profiles of non-standard workers. Another aspect of inequality relates to gender disparities in hourly wages and hours worked. Despite major recent increases in female labour market participation and higher levels of educational attainment for recent female cohorts, obstacles to gender equality remain. As Chapter 1 finds, gender pay gaps persist, even when controlling for occupational and sectoral differences and taking into account the fact that women often work shorter hours. These inequalities for women of working age are also likely to translate into gaps in social protection coverage, including pensions. The European Pillar of Social Rights provides a compass for upward convergence in economic and social outcomes, mitigating within-country as well as cross-country inequality. Ensuring rights that guarantee a decent life and improve living conditions is at the core of the Social Pillar. Addressing challenges such as the higher risk of income poverty of workers in new non-standard contractual relationships requires action on several fronts, in particular up-skilling and re-skilling policies, “promoting fair wages and minimum incomes ensuring a life in dignity, gender equality, equal access to quality education and training for all”. It also requires effective social protection, as discussed in Chapter 5. …and it is important to mitigate the risks associated with different working arrangements. Social protection helps workers and families to cope with unforeseen circumstances and life-course needs, for example through replacement incomes, cost compensation or through enabling social services. However, faster economic restructuring or automation can be expected to amplify social risks, including (long-term) unemployment. Similarly, many of the non-standard forms of work increase flexibility for both workers and employers but increase income volatility for workers by making careers less predictable. Non-standard forms of work which blur the distinction between employment and self-employment raise questions about workers' access to social benefits, as well as the financial sustainability of social protection systems. Many of the existing national social insurance systems were designed primarily to protect "standard" employees and their families. This model provides social insurance primarily for employees who work full-time in an open-ended contract with a single employer. These insurance systems pool the risks of large groups of workers, some of whom receive income support when they lose earnings because of involuntary unemployment, maternity, sickness or disability. Workers and employers together make a major contribution to the financing of social protection. In effect, part of the labour cost is earmarked for this purpose. …as most schemes were designed to protect workers in standard forms of employment. Other forms of social insurance or assistance in the EU are less directly linked to employee status. They tend to aim for general coverage, based on citizenship. Such universal systems rely to a larger extent on financing from general government revenue. The same applies to residual social protection systems that target groups with very low income. Specific groups of workers, such as the self-employed, can experience difficulties in obtaining social protection coverage. Casual, seasonal or freelance workers, apprentices and (vocational) trainees may be formally excluded from benefits for unemployment, sickness, maternity or other risks. In several Member States, the self-employed are often excluded from social security schemes. Even where workers are formally allowed to join a scheme, they may fail to fulfil eligibility conditions. In addition, rights and entitlements may not be fully transferable when workers take up a new job. Hence a substantial number of workers are not covered by existing social insurance schemes. The ensuing gaps in the coverage of social insurance can put additional pressure on safety nets of last resort and therefore lead to increasing reliance on means-tested entitlements. At present, the proportion of means-tested benefits in social expenditure is relatively low in the EU. There are small-scale experiments in or simulations of universal income to address the gaps in coverage, but they do not yet allow predictions about how this could affect work incentives or wages. More importantly, the impact on individuals' incentives and public finances remains uncertain, and so does the level of benefit that could be provided to the population. …and coverage gaps may lead to more means-tested benefits or debates on universal income. Structural changes in the labour market will likely have important implications for Member States' social security financing. Population ageing and changes in the world of work may lead to a shrinking contribution base for social protection and, in turn, increase the burden on the remaining contributors to welfare systems. Therefore, in addition to ensuring that people in all forms of contractual relationships contribute to the financing of social protection, governments may look to supplement social contributions by other types of taxes. Ageing populations and more non-standard employment may shrink the financing base for social insurance. However, a future-proof social welfare system would not only provide payments to protect workers from a sudden loss of income and unexpected expenditure; it would also deliver key social and health services, including an individualised approach to professional development and employability support through their lives. Empowering workers to fulfil their labour market potential contributes to the financial sustainability of social protection systems and can yield high returns both to individual workers and the economy. Modernised social welfare needs to be more encompassing. Fit-for-purpose social protection systems can contribute to the smooth functioning of the labour market and to inclusive growth. The principles enshrined in the European Pillar of Social Rights provide a strong consensual basis for social protection systems which invest effectively and efficiently in people and support them through changes stemming from new and emerging challenges. As part of the Social Fairness Package, on 13 March 2018 the Commission presented a proposal for a Council Recommendation on access to social protection for workers and the self-employed. Current technological, economic and social changes, such as digitalisation, globalisation, ageing, and changing life-styles, are strongly interlinked. Together they are transforming the organisation of work and the social dialogue. The social partners at European and national level, as well as at cross-industry and sectoral level are aware that ongoing changes are having an impact on the organisation of work. Their joint strategic documents show where negotiations between the social partners can help to shape the future of work in a sustainable way. In their discussions with public authorities, the social partners agree on the importance of the framework established by labour and social legislation. However, there is not much consensus on how and to what extent this framework needs to be revised. The current technological, economic and social changes are transforming industrial relations. The social partners generally agree that the changing world of work implies an increased demand for hard and soft skills directly linked to digitalisation. They also see the need to manage the transition from skills which are closely linked to activities which can be automated to new job profiles. Assuming that technological progress does not slow down, lifelong learning will gain growing importance. Chapter 6 provides examples of how the necessary up-skilling and re-skilling discussed in Chapters 2 and 3 can be and has been achieved through the joint efforts of the social partners. Strategies developed so far approach the need for up-skilling and re-skilling both at a sectoral and regional level (to take into account cases where the structural change linked to digitalisation implies the shift of employment from one sector to another in a given territory). This chapter discerns a pattern: cases which are managed with the support of trade unions are in general more all-encompassing. By contrast, in situations not involving independent representation of workers, there is a more pronounced divide between winners and losers. Social partners have developed good examples of up-skilling and re-skilling strategies. What is also pertinent to all workers is the major role social dialogue can play in shaping the increased flexibility in the time and place of work, which is facilitated by the new IT tools. Social partners agree in many instances that the traditional approaches to working time are no longer adequate. The discussion on working time is shifting away from the customary polarised debate in which the trade unions ask for shorter working times and the employers seek more flexibility. New options are being considered, balancing employers' and workers' needs on a case-by-case basis, albeit under the umbrella of collective agreements. Social dialogue can help to manage the increased flexibility of work. However, the increasing diversity of contractual relationships means that the solutions developed by the social partners up until now might not be open to all workers. One reason is that certain work relationships blur the distinction between employees and self-employed. For instance, workers in the platform economy and freelancers may not fit into this type of categorisation. In contrast to fixed-term employment, temporary agency work or self-employment, some of the new non-standard forms of work are more difficult not only to insure for but also to organise. The representation of workers' interests in this more individualised labour market is increasingly problematic. These changes may be one of the factors explaining the decline in trade union membership. Atypical work challenges the existing forms of social dialogue. This difficulty notwithstanding, Chapter 6 provides an overview of cases where social partners have succeeded in entering into a constructive social dialogue over the last fifteen years, thanks, among other things, to new recruitment strategies devised by trade unions. In parallel, bottom-up initiatives providing services to non-standard workers and initiatives enabling semi-structured action are emerging, possibly paving the way for a development of collective action suited to the needs and preferences of workers engaged in non-standard forms of work. In certain instances, trade unions have engaged in coalition-building to increase the legitimacy of joint advocacy activities. Employer organisation density has been fairly stable over the past decades. This can be attributed to the success employer organisations have had in providing targeted services to their members in the changing economic and organisational landscape. However, new forms of work challenge not only the trade unions. In some cases it is no longer clear who the employers are. In fact, some new forms of work might be considered as efforts by employers to avoid the responsibilities normally associated with that role (e.g. taxation, social security contributions) and to delegate them to society or to the individual worker. The social partners are making various efforts to maintain collective bargaining coverage, because their continued ability to do so safeguards their relevance and justifies their autonomous status. …and employer organisations are challenged to keep their members aboard.